Yennai Arindhaal with Ajith opened with huge positive response and now what is director's next movie going to be.Will he join hands with Vijay for already shelved 'Yohan Adhyayam Ondru'? Gowtham Menon recently says that Yohan Adhyayam Ondru would resume soon and has not been dropped. 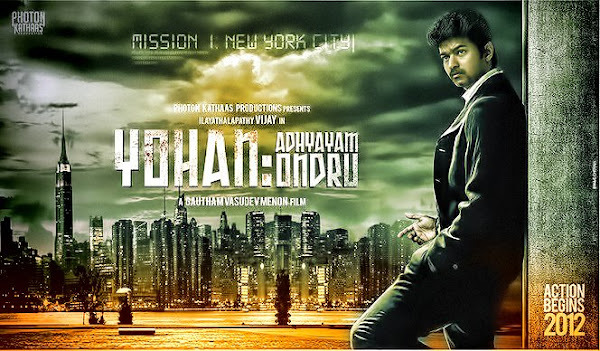 Gowtham Menon and Vijay project Yohan Adhyayam Ondru announced some months back and did not take off as planned. Due to some misunderstanding the project was shelved. In a recent interview to a popular Malayalam daily, Gautham Menon has opened up about Ilayathalapathy Vijay's Yohan: Adhyayam Ondru. When asked why the project was stalled in the first place Gautham has said Yohan: Adhyayam Ondru is a film that has London as its backdrop. Since the story takes place in London, I had initially written a lot of dialogues in English. But Vijay backed out of the project saying that this film wouldn't appeal to his fans. Talking about reviving the project, Gautham has said the project has not been shelved and that he will soon start working on the film once he makes some adjustments in his script. Whether or not Vijay will be a part of the film is not clear as of now. When Vijay lost his cool he requested Gautham to get back to him whenever he is ready with the full script. Now we all know that Gautham is a director who refuses to divulge everything about the script even when he is working with top actors. Whether Vijay will adapt himself to Gautham's style of filmmaking or whether Gautham will opt for a different actor when he re-starts his work on Yohan: Adhyayam Ondru remains to be the question of the year.